Review by Thedoros of Athens, Greece. Superb eyepiece with great eye relief! I was used to plossl but this one made the difference. The only problem I had is to focus with my 10'' Skywatcher Dob, maybe because of light polluted sky. As a total would definitely recommend this EP. Review by Puterfan of Aloha, OR. Since purchasing this eyepiece, it is the one that I initially start out with viewing. With the 55deg view, it gives a nice expanse of the object. I use this with a Celestron XLT 6" refractor, and the views have been outstanding. The view is crisp and clear within the whole FOV. I have been entertained with views of Mars that I have never seen I was actually able to see, though faintly, dark areas on the planet surface. I plan on getting several more of these 'ED' eyepieces. Thank you Agena for an outstanding product. Review by John B. of Kalispell, MT. Started out with six of these ED eyepieces, but had a gap between the 9.5 and 5.2. Most nights the 5.2 was to much for my C11, and I always wanted to see if I could get a little more than the 9.5. Now, the 7.5 is usually the highest I can go on an average night. I have the whole set, and every mag I could need for the price of one or two "premium" eyepieces. These are definately a step up from my Celestron plossls and the lack of need to refocus between eyepiece changes is great. I'm glad I got them, and glad I got them through Agena. 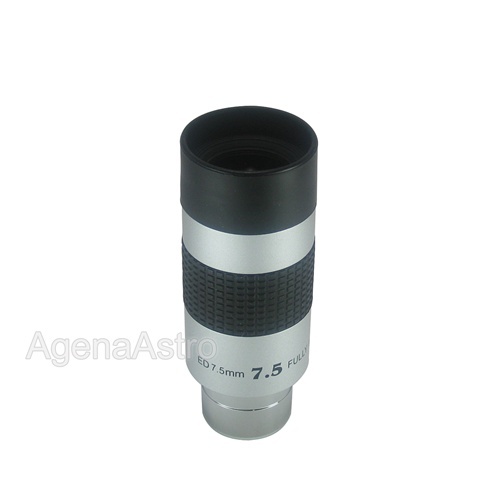 After using a 21 mm Agena AstroProducts 1.25" ED Eyepiece I knew I had to replace my 9mm Meade Plosil with this one. Larger FOV. Way better eye relief and a clear sharp image from edge to edge. I see twice as much with less eye strain than I ever could with my 9 mm. Review by No nick name of Grosse Pointe Michigan. Astronomy is my hobby and my latest purchase makes my viewing more enjoyable. Review by Skooter60 of Hatfield PA. This is a great EP. The FOV is large and pretty clear to the edges. I've used it in my 120mm F/5 and the moon looked great. The color and clarity are excellent and the eye relief is great. I can't see myself looking through a Plossl again.